Plastic waste from one of the world's best restaurants is being transformed into hexagonal stools by Spanish designer Andreu Carulla. 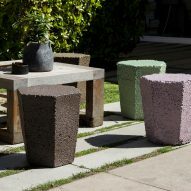 Called RR201, the polystyrene stools were commissioned by three-Michelin-starred El Celler de Can Roca in Girona, Spain. The restaurant – which is frequently named as one of the top 10 eateries in the world – operates a zero-waste policy. Through its recycling program, called Roca Recicla, it recycles and reuses glass on a small scale. But Catalan-born designer Carulla felt the restaurant could also find a new use for the expanded polystyrene boxes that it uses to store and transport food. "We were brought on board to transform materials that are more difficult to recycle, and polystyrene is the first material we decided to explore," Carulla told Dezeen. Carulla has a long-standing partnership with the restaurant, having previously worked on projects such as hot ice-cream makers, lab-inspired whisky glasses, sketched cutlery and bendable plates. But this is the first design that uses the restaurant's waste. 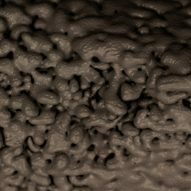 As expanded polystyrene is difficult to recycle, the designer had to come up with an entirely new process. The polystyrene boxes are cleaned before being shredded into raw material and compacted into a mould. Steam is then injected, causing the polystyrene to bond together and expand into the mould. 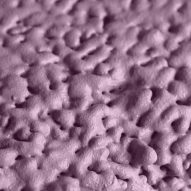 Once formed, the uneven textured objects are given an eco-friendly coating, available in three colours. 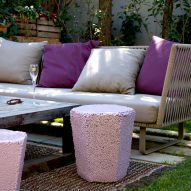 The coating provides rigidity, water-tightness and makes the stools suitable for outdoor use. The stools are made in Carulla's studio in Banyoles, Catalonia, using a custom-made press and a custom-made peddle-operated grinder. The entire process is carried out by hand in order to use as little energy as possible, and the steam injection can be done using the steam from a regular coffee machine. 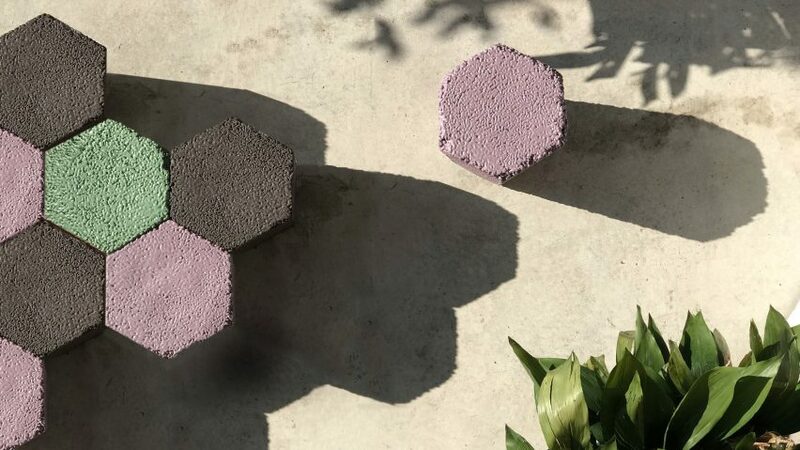 Carulla said that the slightly tapered honeycomb-shaped stools, which are currently in use on the restaurant's patio, are durable while weighing less than two kilograms each. Typically, the restaurant gets through six polystyrene boxes per day, which is enough to make one RR201 stool. "The restaurant will make one stool per day that will be numbered with the delivery date of the original polystyrene boxes," explained Carulla. 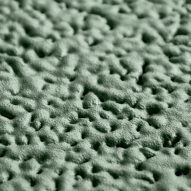 "Although produced by mould, each stool varies in surface texture, meaning that no two are exactly the same." "The form was dictated very naturally," he continued. "Because we had to create something that contained the exact material of six boxes, a stool was a perfect fit. We knew we’d be creating quite a few so the shape had to be useful for flexible use: a stool, a pedestal, a side-table… and therefore also modular to create large surfaces if wanted, hence the hexagonal top." "Just anecdotally, the six sides of the hexagon also alludes to the fact that it is made from six boxes," he added. "The stools are meant to last a lifetime and are designed as such. But if the need did come about, the coating could be separated from the polystyrene and each material could be recycled individually." The stools were presented in the courtyard of Milanese gallery Spazio Rossana Orlandi during Milan design week, where they were shown in a limited-edition colour. They were one of many sustainable projects on show, as gallerist Rossana Orlandi launched a campaign urging designers to favour "guiltless plastic". 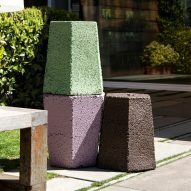 The stools, which are now part of the restaurant's Roca Recicla series, were exhibited in the courtyard at Milanese gallery Spazio Rossana Orlandi during the city's annual design week, where they were shown in a limited edition colour.